It’s a notion that might have come from the pages of a science-fiction novel — an electronic device that can be injected directly into the brain, or other body parts, and treat everything from neurodegenerative disorders to paralysis. Sounds unlikely, until you visit Charles Lieber’s lab. Led by Lieber, the Mark Hyman Jr. Professor of Chemistry, an international team of researchers has developed a method of fabricating nanoscale electronic scaffolds that can be injected via syringe. The scaffolds can then be connected to devices and used to monitor neural activity, stimulate tissues, or even promote regeneration of neurons. Though not the first attempt at implanting electronics into the brain — deep brain stimulation has been used to treat a variety of disorders for decades — the nanofabricated scaffolds operate on a completely different scale. “Existing techniques are crude relative to the way the brain is wired,” Lieber said. “Whether it’s a silicon probe or flexible polymers … they cause inflammation in the tissue that requires periodically changing the position or the stimulation. The process for fabricating the scaffolds is similar to that used to etch microchips, and begins with a dissolvable layer deposited on a substrate. To create the scaffold, researchers lay out a mesh of nanowires sandwiched in layers of organic polymer. The first layer is then dissolved, leaving the flexible mesh, which can be drawn into a needle and administered like any other injection. 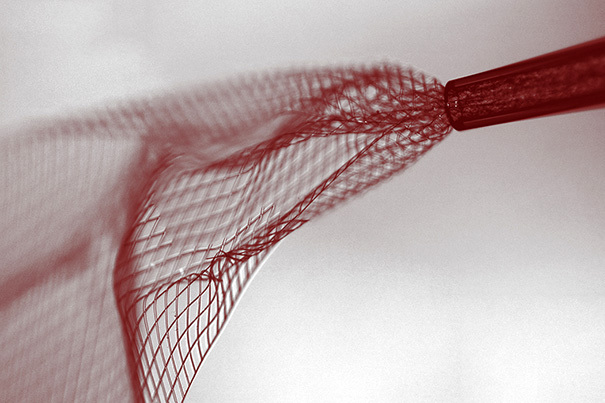 The input-output of the mesh can then be connected to standard measurement electronics so that the integrated devices can be addressed and used to stimulate or record neural activity. Going forward, researchers hope to better understand how the body reacts to the injectable electronics over longer periods. “The idea of being able to precisely position and record from very specific areas, or even from specific neurons over an extended period of time — this could, I think, make a huge impact on neuroscience,” Lieber said.